The specs for this build can be found at the bottom of this post, but we know you’re probably just here for the photos. 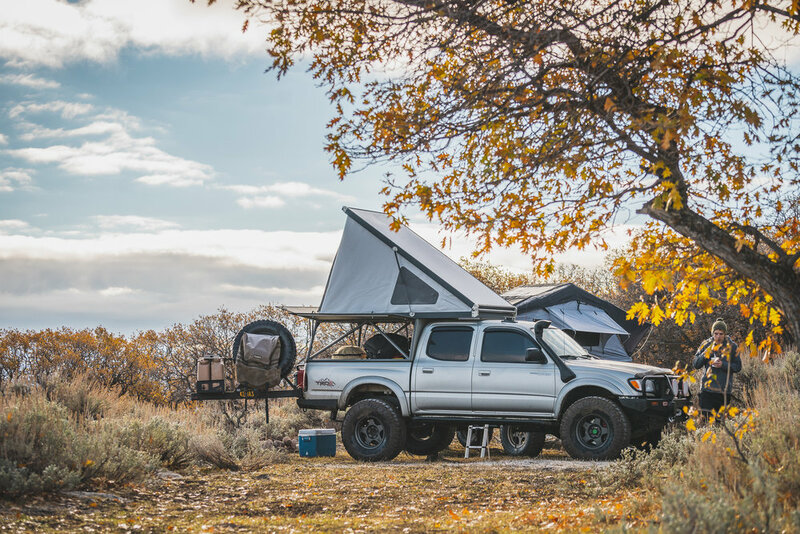 Jason camps and drives all over the varied terrains of the American West. 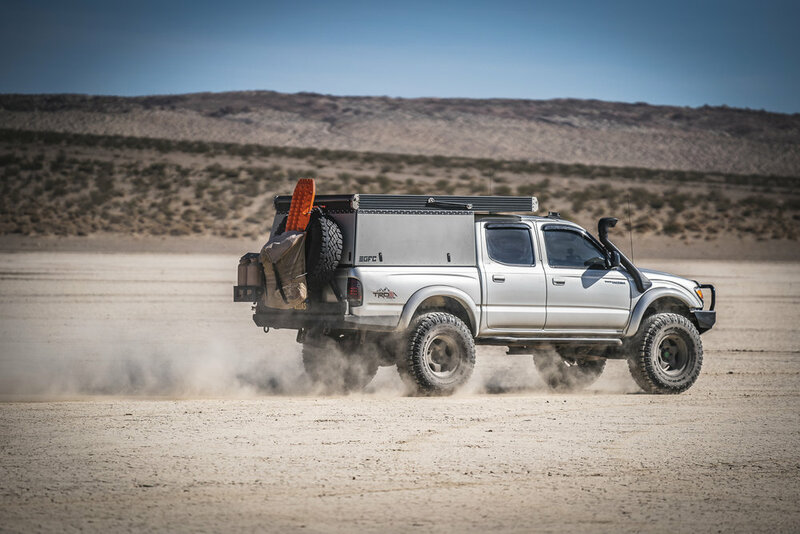 His choice of camper is well suited to the dust, rain and rigors of driving off road allowing him to keep his gear storage and sleeping area clean. In the photo above, you can see a pair of Maxtrax throwing up a friendly hi-five. What’s up, Maxtrax! If you squint just right, you might even see Koda’s omnipresent gaze. 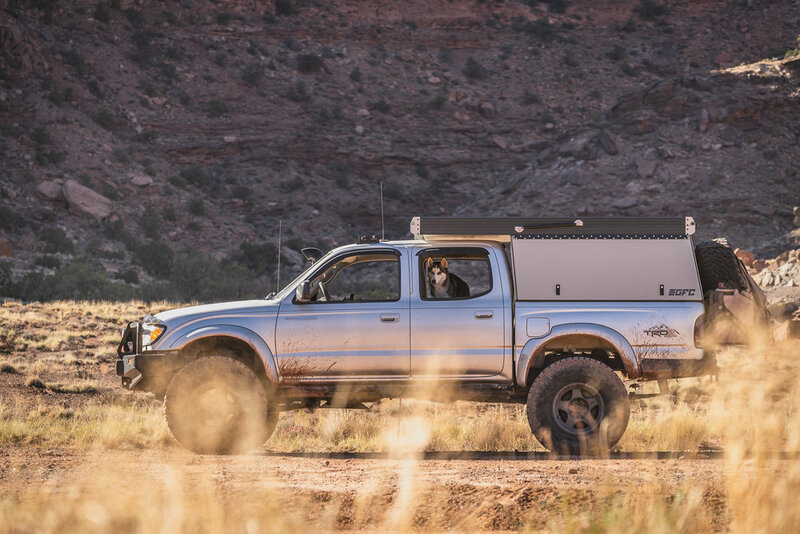 The tiny bed of the Tacoma doesn’t leave much room for gear. The custom rear bumper helps to keep some of the bulkier items from crowding the interior. I’m sure Koda appreciates the extra room to stretch out at night. Just a few of the backdrops one can see in the expansive Western region of the United States. We really do have some beautiful vistas and varied terrain here. Even the freezing cold won’t keep Jason and his furry companion, Koda out of the backcountry. Of course, he’s not a total savage, niceties such as seat heaters make it more bearable. Overall, this is a very well thought out rig. It does everything Jason asks of it and asks for more. Currently, he is in the process of tearing down and re-organizing the bed space to make things more accessible and secure. Just another reminder of the amount of trial and error that goes into building a proper off road rig.